Actually this was the first time I tried the Cactus V4s. We were very happy about a packed day with travel through the St. Gotthard tunnel, visiting Locarno, and a short walk in Melide, and we sat down in the garden of a the restaurant to eat something. 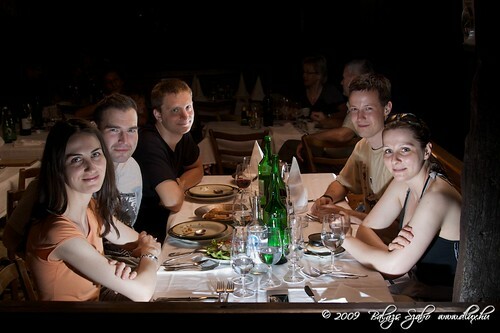 I brought two flashes with me (580 EX II), plus two triggers. I don't usually go to restaurant with full set of umbrellas and lightning equipment, so I needed to take a photo with this set, and since I had to wait a little bit for the food, I started to play with putting the flashes to different positions, and see what comes out. The first flash was put just in front of the camera in the bench, hidden by the back of the bench, pointed directly to the group. The other flash was behind the second person on the right side, pointed to the roof, to give some fill from the top and some backlight also. I don't really remember the settings, but I think the front-flash was set up to the widest possible and about 1/4, and the back was set up to 1/2 and the narrowest possible. I did not have any problems with the triggers, they did their job very well even when the flashes were not visible form the camera. Maybe that's because the flashes was not too far (2 and 4 meters), very much inside the 30 meter range, which was in the specification documentation of the transmitter.